New century, same amazing results! You can’t argue with more than 90 years’ worth of satisfied customers. That’s why our effective itch treatment formula, our trustworthy name and our iconic blue star haven’t changed since 1920. There’s a reason Blue Star Ointment is still such a popular antifungal cream and itch treatment after all these years: it works! In the early 1930s, Robert Whitehead used Blue Star Ointment as an eczema treatment and was so impressed that he not only became a loyal customer — he also bought the formula and started sharing it with the country! 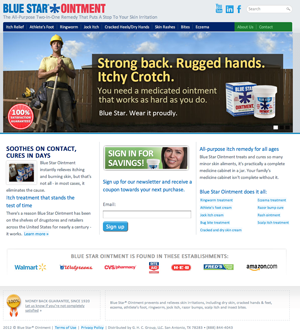 Blue Star Ointment was created by a chemist in tiny Plantersville, Texas. When Robert Whitehead bought it, he turned it into a national sensation, but he never lost sight of what’s important. It’s safe for adults and children alike, containing no hydrocortisone or steroids. No family’s medicine chest is complete without these all-purpose itch remedies. To this day, Robert Whitehead’s family keeps his values and his memory alive: His daughter Gail serves as CEO, his son Henry is the company’s financial adviser, and his granddaughter Sonya handles day-to-day operations. Headquartered in San Antonio, Texas, we at Blue Star Ointment are committed to improving the quality of life in the communities in which we live and operate. We provide resources to aid the initiatives of local charitable organizations that are dedicated to enhancing social, economic, physical and educational opportunities.